Now, remember, this is Arizona, the land of “Fire in the Sky” and a state where there is a lot more of nobody than somebody. If’n aliens were going to land and probe somebody, this would be a great place for them to find someone a long way away from anybody. However, we had seen this very same type of cloud formation before, in the east, pre-dawn – while we were living in Tucson, lo these fifteen years ago. 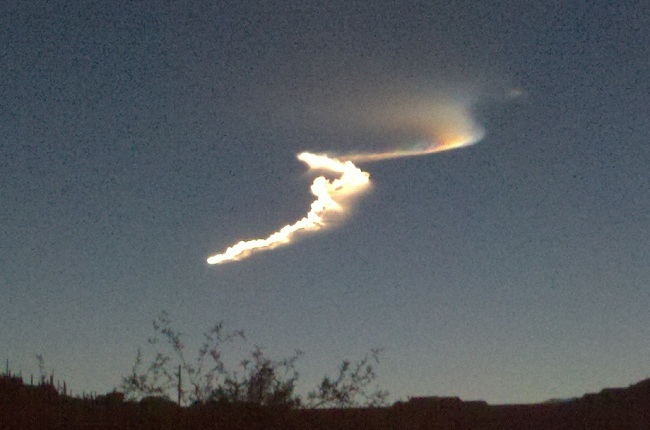 And they said then that it was a contrail from a morning missile launch at White Sands. This time, they got that news out earlier. And get this – they said that they had only done four of these missle launches in the last sixteen years. And we’ve seen two of them? Even though we were gone for eight years in the middle? That just seems a mite unlikely. And it’s not like we get up early every morning to search the eastern sky for missile contrails. But, if that’s what the Air Force says, then I reckon we’ll believe it. At least until some aliens land and abduct Lucy the World’s Dumbest Cocker Spaniel and probe her with a sledgehammer or a pitching wedge. Of course, the poor puppy wouldn’t live through that. But, having seen these morning lights in the sky, we’d know that the Air Force was lying, and we’d know who to blame for Lucy’s untimely demise. No, no – not any human being on the ground here who might have had to put up with Lucy for the last eight years and who has absolutely had enough of having his office carpet peed on and hearing her bark at absolutely anything or nothing at all and had to listen to her mewling at the back door every time her momma leaves the house, making that neurotically dependent whine until his brow furrowed to the point where he could knit his eyebrows together. Nope – we’d know that it was Aliens, for sure. And the government is trying to cover it up, leaving somebody else to blame. We can’t have that. JimBob, those were not spammers that filled the comments section. They were aliens who are pissed off that you are not treating their love child Lucy with the respect she deserves. Too bad you’re not a South Park fan. One of the first episodes revolved around Cartman getting probed. You’ve been warned. The aliens talk to me, too. Keep trashing Lucy and they will become Auburn fans and probe the Tide. Oooh Jim now that is just mean. Poor ole ducks stuck in that lil old west coast conference that nobody watches. You be nice now. Can you send them to Alabama, goty 4 codependant dogs here. Actually, the aliens are not from Planet Scott. I used to know the name and the right galaxy, but they flashed this pencil and I got fuzzy on the details. They looked like elephants with legs and wore red.. Lucy can tell you about it, if you would only listen. I was offered tickets to the Duck game today. Somehow, I could not rationalize a three hundred mile drive to watch them massacre Tennesee Tech. See, that’s why the Pac will NEVER equal the SEC. Bama fans travel cross country JUST TO WATCH THE SPRING PRACTICE game. Sorry excuse for a football conference, that Pac. Ethel, we left coasters watch the Pac 10. And since we live on the left coast, and therefore are morally, ethically, and spiritually superior to everybody else in the country, we appreciate that back east games come on in the morning, so we have something to watch with our coffee. Can’t send aliens to Alabama. Nick’ll try to recruit ’em. And I’m SURE that there’s an NCAA reg against that. This cloud looks like the caterpillar smoking the hookah pipe in “Alice in Wonderland”. BTW, Ethel, the mere fact that Bama fans travel to watch a spring game merely proves that the aliens probed them and now control their higher brain functions. Ask Lucy. She’ll tell you. ps: unless you are an evolved left coast type, you are incapable of remembering being kidnapped and probed. Ask Lucy. She remembers. So do I. That’s why Lucy loves me.